Heat two tablespoons of olive oil in a large heavy bottom pot over medium-high heat. Add in onions and garlic. Cook until translucent and fragrant, about 5 minutes. 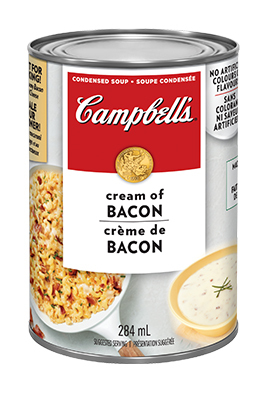 Pour in Campbells® Condensed Cream of Bacon Soup and stir. 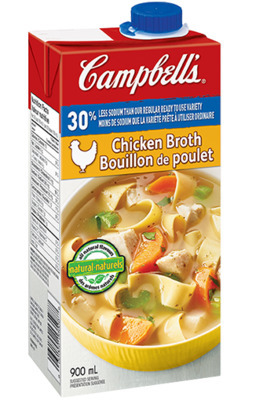 Stir in Campbells® 30% Less Sodium Chicken Broth and bring mixture to a simmer, stirring frequently. Ladle enough sauce to cover the surface of a 9x13 oven safe dish, about 1/2-3/4 cup. Layer 5 lasagna noodles lengthwise over the sauce to cover the surface of the dish, breaking noodles when necessary. Ladle about 1/2 cup sauce to cover the noodles. Crumble 1/3 of the ricotta cheese over the noodles, and then layer 1/2 cup of Parmesan and 1 cup of mozzarella. Layer 5 lasagna noodles over cheese layers in the opposite direction, breaking the noodles to fit in the dish widthwise. Repeat layering pattern 2 more times beginning with the sauce, three cheeses and lasagna noodles (changing noodle direction each time from lengthwise to width wise). Ladle sauce over noodles, then layer on Parmesan and remaining mozzarella. Bake in oven until cheese has melted and become golden and crispy on top, about 30 minutes. Let rest on counter for 15 minutes before slicing. 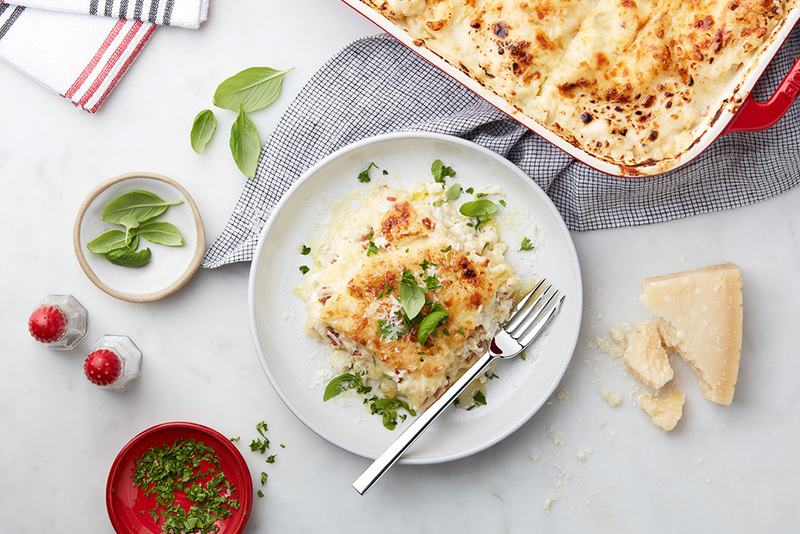 Plate Lasagna and garnish each slice with chopped parsley and basil, Parmesan cheese and a drizzle of olive oil.